For professional baseball players, Syracuse, N.Y. has long been a way station. Many play there. Few stay. Steve Grilli stayed. Which is why his son, Jason, became an avid Blue Jays fan as a youngster. In the early 1990s, he saw some very good Toronto teams. From the Blue Jays’ inception in 1977 through 2008, Syracuse was their Triple-A team. Steve Grilli pitched in 70 big-league games – 69 with Detroit and one with Toronto. He spent parts of four seasons in Syracuse at the end of his career. Jason was a pre-schooler then. His dad stayed and opened a tavern called A Change of Pace, which he still co-owns. 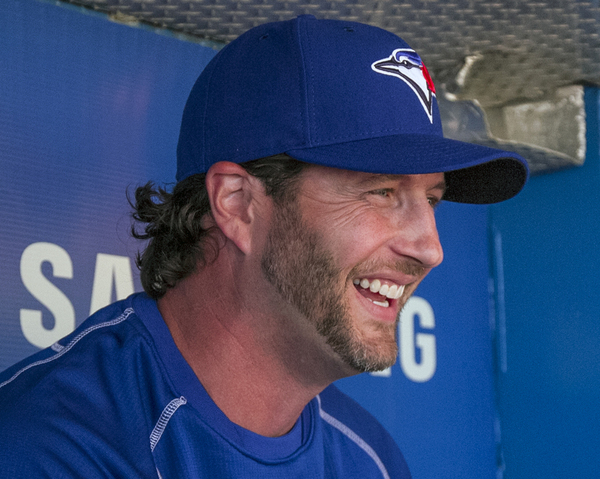 Now, at 39, Jason Grilli is the newest source of hope for the Jays’ beleaguered bullpen. A right-hander in his 14th season, he had 24 saves and a 2.94 ERA for Atlanta before the all-star break last season. Then he ruptured his Achilles tendon covering first base, underwent surgery on July 16, and was done for the season. His long recovery delayed his entry to spring training and his April did not go well. Lately, his work has improved (six scoreless outings in his past eight games) and he has 23 strikeouts in his 17 innings (and 13 walks too). But he had lost his closer’s job. And with the woeful Braves in a rebuilding mode, he had a sense he might be on the move. As for that 5.29 ERA he logged in Atlanta, Grilli said it has taken him a while to find his groove after his long rehab. Grilli has posted a 4.12 ERA in 503 games with eight clubs. He also pitched in the minors with four other organizations. In his Toronto debut Wednesday night, he relieved Aaron Sanchez with two outs in the seventh inning, runners on first and second and a 2-0 lead over the Yankees. The first thing he did was throw the ball into centre field trying to pick the runner off second. Then he bent down, tied his shoes and took a deep breath. “The adrenaline was definitely flowing,” he said. Four pitches later, he retired Carlos Beltran on a line drive to centre field to quash the threat. The crowd roared its approval. “There’s an energy here that I’ve craved for a while,” he said after the game. Grilli’s best year was 2013 when he saved 33 games for Pittsburgh, logged a 2.70 ERA and made the all-star team. That year, the Pirates won 94 games over their first winning season in 20 years. Grilli’s catcher that year – and again Wednesday night – was Russell Martin. The state of the Jays’ bullpen had plenty to do with the Jays taking a flyer on Grilli. Only closer Roberto Osuna and rookie Joe Biagini have been reliable. The Jays’ pen has lost 14 games, most in the majors, blown eight saves and allowed 41 percent of inherited runners to score. “We’ll get a look at him later in the game, see how he pitches,” manager John Gibbons said when asked how planned to use his latest addition. Grilli pitches far better against right-handed batters (.604 career OPS) than lefties (1.057). Gibbons seemed to suggest he will not be influenced by those splits. Grilli could prove valuable in another way, as a veteran presence in a bullpen whose two most dependable members – Osuna and Biagini – are young and inexperienced. Grilli comes with a reputation as a personable leader, eager to tutor and support his teammates. “The same way I was treated coming up is the same way I view leadership,” he said. “If a guy needs some time, you need to take him out for a dinner and just get some stuff out. It’s not always baseball-related … It’s just being a friend, being a good teammate. He vividly remembers being part of the boisterous sellout crowds of the World Series years. And last fall, while he was “all casted up and bound up” during his recovery from surgery, he watched on TV and saw that earsplitting ambiance rekindled during the Jays’ playoff run. Now, he says, he’s happy to be joining what he calls a “contending” team and eager to feel those vibes again. “I’m excited to get that energy that I was lacking (in Atlanta),” he said. It didn’t take long for him to get it. POSTSCRIPT 1: Grilli’s Achilles injury was the latest in his “all-star lineup of surgeries.” The list is long. The lowlights include Tommy John surgery, a hairline elbow fracture and a severe knee injury in 2010 that forced him to miss the entire season after signing with Cleveland. POSTSCRIPT 2: Grilli’s father missed qualifying for a full big-league pension by one game under the rules of the day, which were subsequently changed. He was vocal about the inherent injustice of the pre-1980 policy. In 2011, MLB and the players’ union agreed to make annual payments to players affected by the old rule. Steve Grilli is quoted extensively on that issue in this article by Nick Diunte.